February 24, 1955: Jobs was born in San Francisco to graduate students Abdulfattah “John” Jandali, and Joanne Carole Schieble. Jobs was placed for adoption after Schieble’s father opposed their marriage. 60s-70s: Jobs attended Cupertino Junior High and Homestead High School in Cupertino, California. He frequented after-school lectures at the Hewlett-Packard Company in Palo Alto, California, and was later hired there, working with Steve Wozniak as a summer employee. 1972: Jobs enrolled at Reed College in Portland, Oregon. He dropped out after one semester to visit India and study eastern religions in the summer of 1974. 1974: Jobs took a job as a technician at Atari, Inc., a manufacturer of video games. 1975: Jobs joined a group known as the Homebrew Computer Club. One member, a technical whiz named Steve Wozniak, was trying to build a small computer. Jobs became fascinated with the marketing potential of such a computer. 1976: Jobs, Steve Wozniak and Ronald Wayne founded Apple. 1978: Apple recruited Mike Scott from National Semiconductor to serve as CEO for what turned out to be several turbulent years. Early 1980s: Jobs was among the first to see the commercial potential of Xerox PARC’s mouse-driven graphical user interface, which led to the creation of the Apple Lisa and, one year later, the Macintosh. 1984: Apple aired a Super Bowl television commercial titled “1984”. At Apple’s annual shareholders meeting on January 24, 1984, an emotional Jobs introduced the Macintosh to a wildly enthusiastic audience. However, an industry-wide sales slump towards the end of 1984 caused deterioration in Jobs’ working relationship with Sculley. May 24, 1985: Apple’s board of directors sided with Sculley and removed Jobs from his managerial duties as head of the Macintosh division. Jobs resigned from Apple five months later and founded NeXT Inc. the same year. 1985: After leaving Apple, Jobs founded NeXT Computer in 1985, with $7 million. A year later, Jobs was running out of money and with no product on the horizon, he appealed for venture capital. Eventually, he attracted the attention of billionaire Ross Perot who invested heavily in the company. NeXT workstations were first released in 1990, priced at $9,999. 1986: Jobs bought The Graphics Group (later renamed Pixar) from Lucasfilm’s computer graphics division for the price of $10 million. 1990: The revised, second-generation NeXTcube was released in 1990, also. Jobs touted it as the first “interpersonal” computer that would replace the personal computer. With its innovative NeXTMail multimedia email system, NeXTcube could share voice, image, graphics, and video in email for the first time. 1990s: Jobs met Laurene Powell at Stanford business school, where Powell was an MBA student. They married on March 18, 1991, and lived together in Palo Alto, California, with their three children. 1993: after having sold only 50,000 machines, NeXT transitioned fully to software development with the release of NeXTSTEP/Intel. The company reported its first profit of $1.03 million in 1994. 1995: After years of unprofitability selling the Pixar Image Computer, it contracted with Disney to produce a number of computer-animated feature films that Disney would co-finance and distribute. The first film produced by the partnership, Toy Story, with Jobs credited as executive producer, brought fame and critical acclaim to the studio when it was released in 1995. In 1996: NeXT Software, Inc. released WebObjects, a framework for Web application development. 1997: After NeXT was acquired by Apple Inc. WebObjects was used to build and run the Apple Store, MobileMe services, and the iTunes Store. In 1996: Apple announced that it would buy NeXT for $429 million. The deal was finalized in late 1996 bringing Jobs back to the company he co-founded. 1997: Jobs became de facto chief after then-CEO Gil Amelio was ousted in July. March 1998: Jobs terminated a number of projects, such as Newton, Cyberdog, and OpenDoc. Jobs also changed the licensing program for Macintosh clones, making it too costly for the manufacturers to continue making machines. With the purchase of NeXT, much of the company’s technology found its way into Apple products, most notably NeXTSTEP, which evolved into Mac OS X. Under Jobs’ guidance the company increased sales significantly with the introduction of the iMac and other new products. 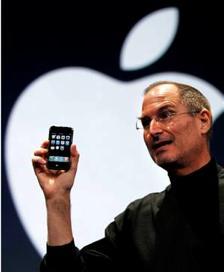 2000: At Macworld Expo, Jobs officially dropped the “interim” modifier from his title at Apple and became permanent CEO. With the introduction of the iPod portable music player, iTunes digital music software, and the iTunes Store, the company made forays into consumer electronics and music distribution. 2003 – 2004: as Pixar’s contract with Disney was running out, Jobs and Disney chief executive Michael Eisner tried but failed to negotiate a new partnership, and in early 2004, Jobs announced that Pixar would seek a new partner to distribute its films after its contract with Disney expired. October 2005: Bob Iger replaced Eisner at Disney, and Iger quickly worked to patch up relations with Jobs and Pixar. January 24, 2006: Jobs and Iger announced that Disney had agreed to purchase Pixar in an all-stock transaction worth $7.4 billion. When the deal closed, Jobs became The Walt Disney Company’s largest single shareholder. June 29, 2007: Apple entered the cellular phone business with the introduction of the iPhone, a multi-touch display cell phone, which also included the features of an iPod and, with its own mobile browser, revolutionized the mobile browsing scene. August 2011: Jobs resigned as CEO of Apple, but remained at the company as chairman of the company’s board. Hours after the announcement, Apple Inc. (AAPL) shares dropped five percent in after-hour trading. The relatively small drop, when considering the importance of Jobs to Apple, was associated with the fact that Jobs’ health had been in the news for several years. October 5, 2011: Apple Inc. announced that co-founder Steve Jobs had died. He was 56 years old at the time of his death. World Apocalypse without Facebook Google+ we are not impressed!